Bookkeeping is the process of recording financial transactions of a company such that they are well organized for reference and preparation of financial statements. Organizations adopt single entry system or double entry system to record transactions. What is Single Entry System? The single entry system is a method of recording financial transactions where only one entry is marked for either a debit entry or credit entry for a specific operation. For example, if a customer pays cash to the enterprise, either cash account will be credited, or debtor account will be debited. One of the standout characteristics of single entry system is that it doesn’t track asset and liability accounts which makes it appear to be more like a checkbook register. This explains why the method is adopted by small business enterprises. What is Double Entry System? The double entry system ensures that for every single debit entry, a corresponding credit entry must be recorded while every credit entry is completed by filing a similar debit entry, which means that each entry has an opposite entry. Organizations are required to adhere to the double entry system when preparing financial statements because it ensures arithmetic accuracy which is essential to the tax department for calculation of taxes. One of the main difference between single entry system and double entry system is the type of record that is captured in the books of accounts and the method through which it is captured. In a single entry system, only single entry is recorded which can be either debit or credit transaction. On the other hand, double entry system has a double recording method in each transaction. This means that for every debit record there is a corresponding credit entry and vice versa. A debit and a credit entry are recorded for any transaction that happens in the enterprise. The complexity and number of transactions play a vital role in determining who adopts single entry system and double entry system. The single entry system is mostly used by small business organizations which include sole proprietors and partnerships. The double entry system of recording financial activities is used by both small and significant business enterprises. Large organizations are required to use double entry system to record their transactions because this method ensures accuracy. Single entry system of bookkeeping does not require any costs to implement. This is because skilled personnel are not needed to aid in recording transactions using a single entry system. It is a simple method of recording enterprise activities. Double entry system of bookkeeping is a technical affair that requires skilled personnel to implement. High costs are involved when hiring trained people such as trained accountants to help in the complicated method of recording financial transactions. It is very tough to detect errors in bookkeeping when an organization adopts the single entry system of recording business activities. A corresponding entry is not available for comparison which means that the level of arithmetic inaccuracy is very high. On the other hand, detection of errors can quickly be done in the double entry method because a corresponding entry has been recorded which can help in comparison. This means that there is a high level of arithmetic accuracy. Single entry system of bookkeeping helps in maintaining personal and straightforward accounts of the debtors and creditors of the organization. 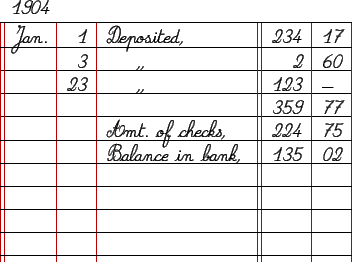 It is also necessary to highlight that single entry system is used when entering entries in the cashbook. The double entry system is highly used in maintaining all personal, real, and nominal accounts of the organization. It is also used in keeping complex financial statements of the company which includes share allotment among others. The single entry system cannot be used in preparing the trial balance of the company because all the transactions recorded in the books of accounts are incomplete. A trial balance can be recorded using the information recorded in the books of accounts because debit and credit of transactions are maintained making it easy to prepare the system. Preparation of the profit and loss account cannot be prepared through the information assembled through the single entry system. This means that this system cannot help the organization to determine its financial position. On the other hand, the double entry system of recording financial transactions of the organization is useful in the preparation of trading profit and loss accounts. This means that the dual entry system of bookkeeping helps the enterprise to determine its financial position. The single entry system is a method of recording financial transactions in an organization where only a single entry is filed after an operation which can be either a debit or a credit concerning the nature of the transaction. The double entry system is a method bookkeeping where for every debit entry there is a corresponding credit entry, and for every credit entry, there is a similar debit entry. The single entry system is a simple method that does not requires skills and knowledge to implement while the double-entry method of bookkeeping is a sophisticated method that requires skills and expertise to accomplish. Single entry system cannot be used to prepare trial balance and profit and loss account which means that it cannot help show the financial position of the country while double entry system is useful when making a trial balance and statement of financial situation for the enterprise. 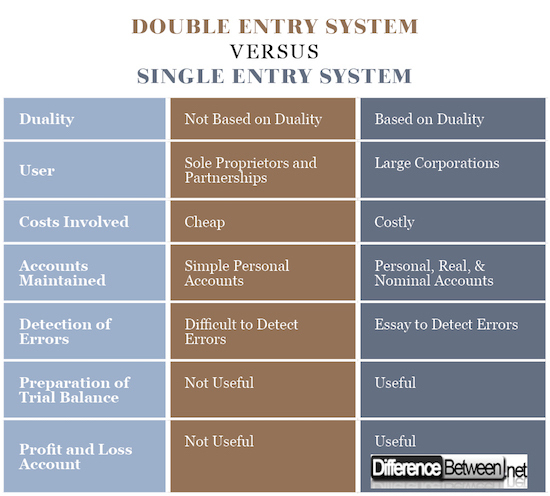 Other differences between single entry and double entry system include complexity, accounts maintained, and detection of errors among others. Jecinta Morgan. "Difference Between Double Entry System and Single Entry System ." DifferenceBetween.net. May 10, 2018 < http://www.differencebetween.net/business/difference-between-double-entry-system-and-single-entry-system/ >. Bryer, Rob A. "Double-entry bookkeeping and the birth of capitalism: accounting for the commercial revolution in medieval northern Italy." Critical perspectives on Accounting4.2 (1993): 113-140. Carruthers, Bruce G., and Wendy Nelson Espeland. "Accounting for rationality: Double-entry bookkeeping and the rhetoric of economic rationality." American journal of sociology97.1 (1991): 31-69. Gardella, Robert. "Squaring accounts: commercial bookkeeping methods and capitalist rationalism in late Qing and Republican China." The Journal of Asian Studies 51.2 (1992): 317-339.